The great urban churches of northern Europe sit on their market places, especially in Cathedral cities. It is as if they were intended as late Medieval statements of civic pride. They are a reminder of the way that the cities rose to prominence in the decades after the Black Death, as if the old order had been broken and a new one was beginning. They were a great affirmation of Catholic orthodoxy and social communion, in the years before the merchants that paid for them embraced Protestantism and capitalism. They are European culture caught on the cusp of the Renaissance, the beacons that lead us into early modern Europe. These things are more easily sensed in the great late medieval cities of Flanders and the Netherlands, for example at Bruges. 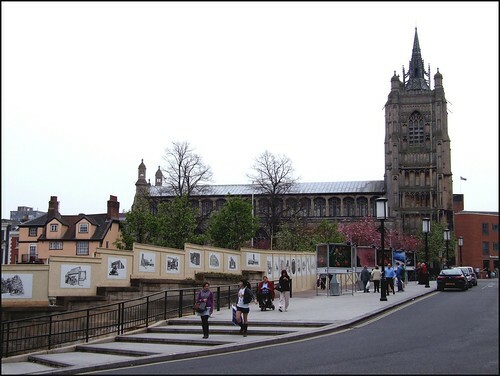 The bridges, the medieval triumph, the tourist tat shops and the foreign voices can create an illusion of being in Cambridge or Oxford, but the great Market Church and Belfry on the main square recall Norwich, where St Peter Mancroft and the medieval Guildhall have a similar juxtaposition. The Industrial Revolution would bring a new wave of cities to prominence, but in the provincial cities that were prominent in the 15th century, Norwich, and Bristol, and York, you still sense the power of those times. Looking at St Peter, the sophistication of its Perpendicular architecture feels a geological age away from the coarse, brutal Norman castle on the far side of the Main Croft ('Mancroft'), which is understandable. 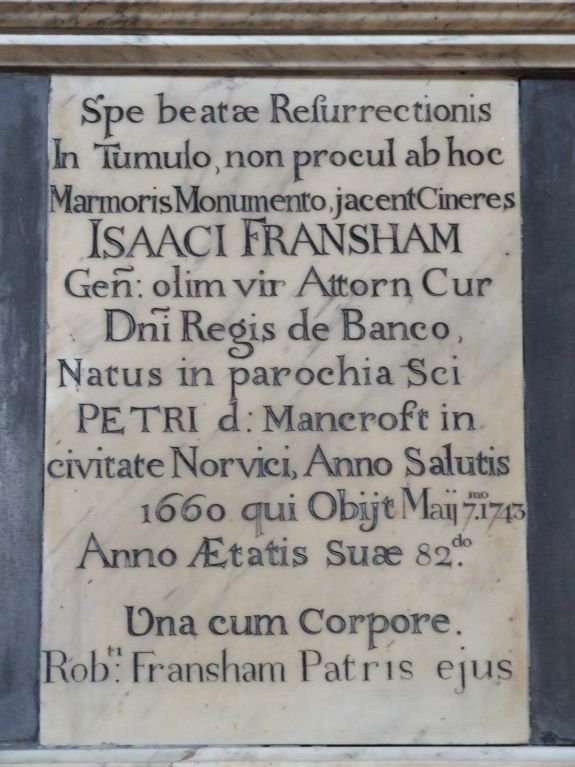 Four hundred years had passed since the Norman invasion, and St Peter Mancroft is as close in time to the Industrial Revolution as it is to the Normans. That is true of all late medieval churches, of course, but seeing the architecture in a city you get a sense that it looked to the future more than to the past. St Peter Mancroft feels entirely at home with the clean, Scandinavian lines of the adjacent 1930s City Hall, and perhaps even more so with the retro-Modernism of the new Forum, whch reflects it back to the city. The Forum was built to replace the Norwich City library, tragically destroyed by fire in 1994, but in style it echoes the confidence of a great 19th century railway station, the roof a triumph of engineering. You are reminded of Cologne, where to leave the railway station and step into the shadow of the west front of the great Cathedral is to merely move from one statement of civic pride to another. The influence of Flanders and the Netherlands is familiar in East Anglia, of course, but it is only at Norwich you sense this sense of civic bullishness. Utilitarian, practical Ipswich demolished St Mildred on the Cornhill in the 19th century - the French Baroque town hall now stands on the site. 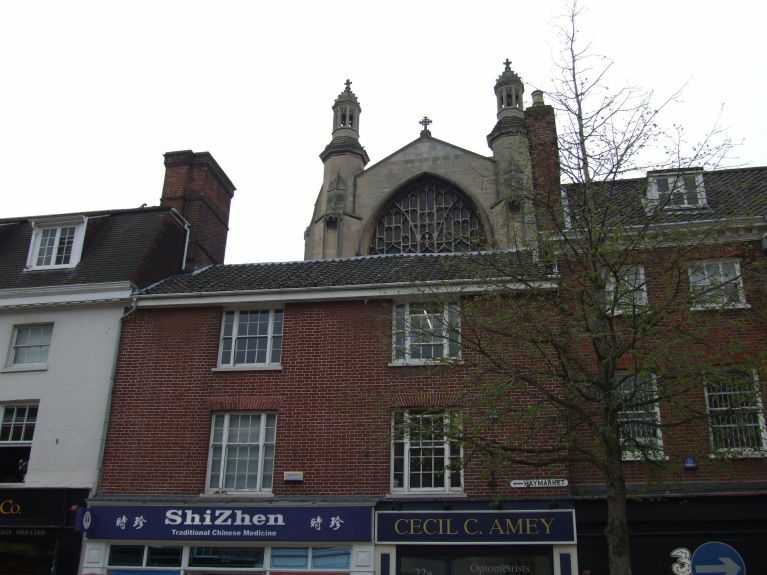 In Cambridge, the market place has been skewed so that today St Mary the Great sits with its east window facing the stalls, as if keeping them at a distance. Worse, it now styles itself the 'University Church'. The great north side of St Peter Mancroft, its massive tower and clerestory like eternal truths rising above the deckchair jollity of the stall canopies, is a constant presence. You can never ignore it. We know that the present church was begun by 1430, and was consecrated on St Peter's Day, 1455. That is, it is all of a piece. 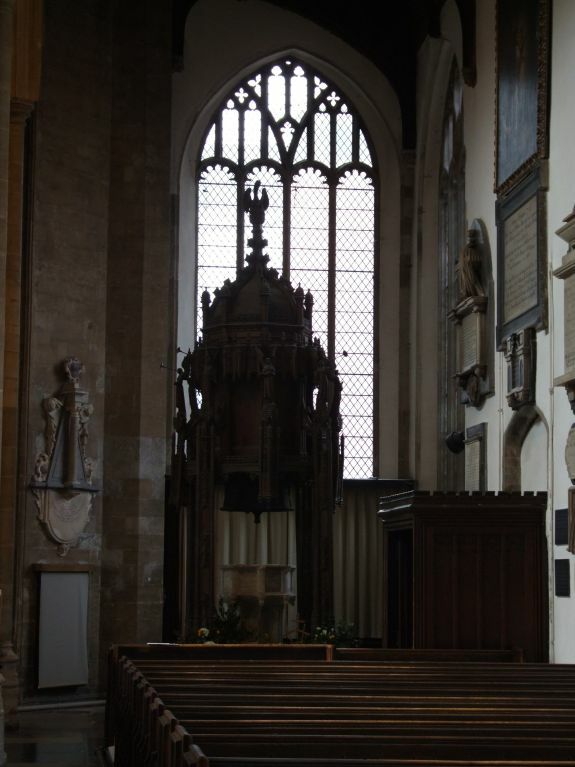 In the nave and chancel there are echoes of near-contemporary Holy Trinity, Long Melford, in Suffolk. The tower is something else again; idiosyncratic, a symbol of power and wealth. There's nothing else quite like it. Pevsner thought it more rich than aesthetically successful, and this is not helped by Street's spirelet of 1881, a flighty thing. There was a massive Victorian restoration here. Before the Streets, pere et fils, came along, diocesan architect Richard Phipson had given it a going over, and there is a sense of the grand 19th century civic dignity of his St Mary le Tower in Ipswich. Of course, hardly anything of these restorations is visible from the outside, apart from a mid-20th century meeting room down in the south-east corner, a jaunty Festival of Britain affair, now a parish tea room. A processional way runs beneath the tower, and there is another beneath the chancel, the land sloping steeply away towards the east. You enter from either the north or south sides, through surprisingly small porches which lead into the aisles. Again, a sense of civic confidence pervades as the interior unfolds before you. There is no chancel arch. The arcades run the full length of the church, the great east window is echoed by that to the west, and if you stand in the middle of the church and look to either end, only the west end organ tells you easily which direction you are facing. The furnishings are pretty much all Phipson's, uneasily heavy under the delicate fluting of the columns. How good modern wooden chairs would look in here! There are civic memorials the lengths of the aisle walls, but because the windows are full of clear glass they are not oppressive here as they are, say, at St Stephen. 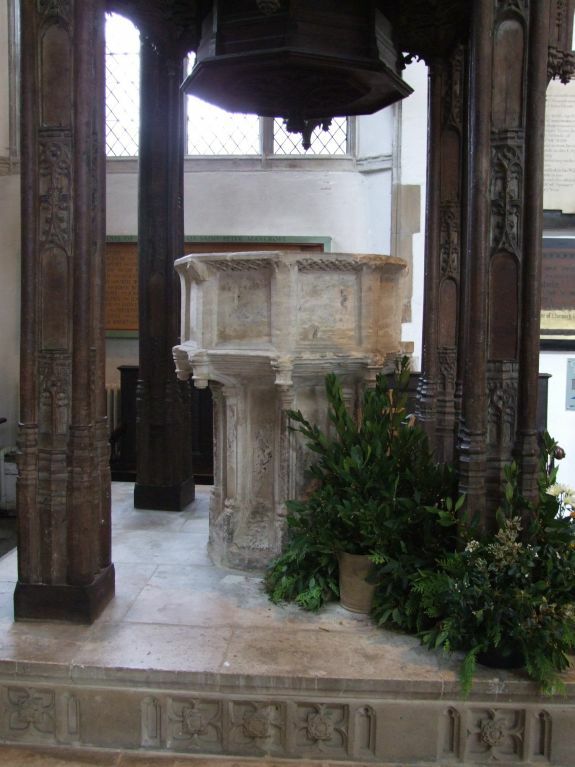 At the west end of the north aisle sits the font on its pedestal. 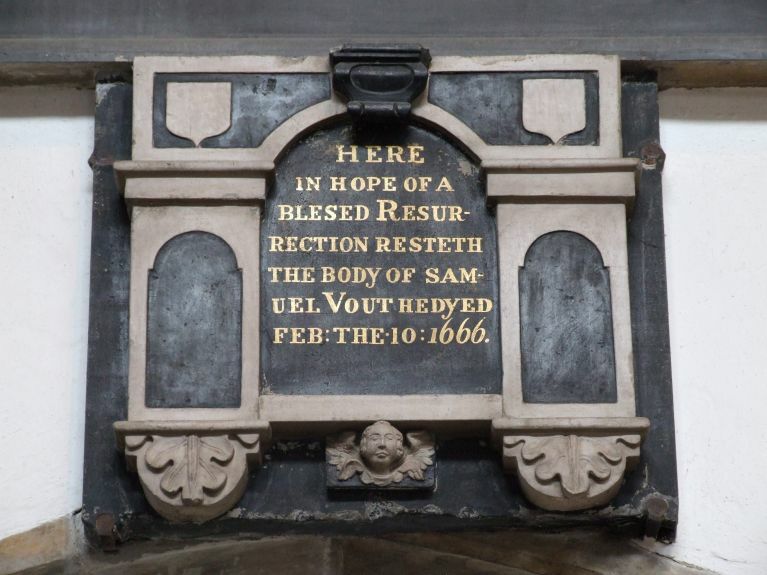 You can see at a glance that it was one of the seven sacraments series, and that all of its reliefs have been completely erased, as in the great churches of Southwold and Blythburgh in Suffolk. At Wenhaston, we know that this happened in the 19th century - could the same thing be true here? 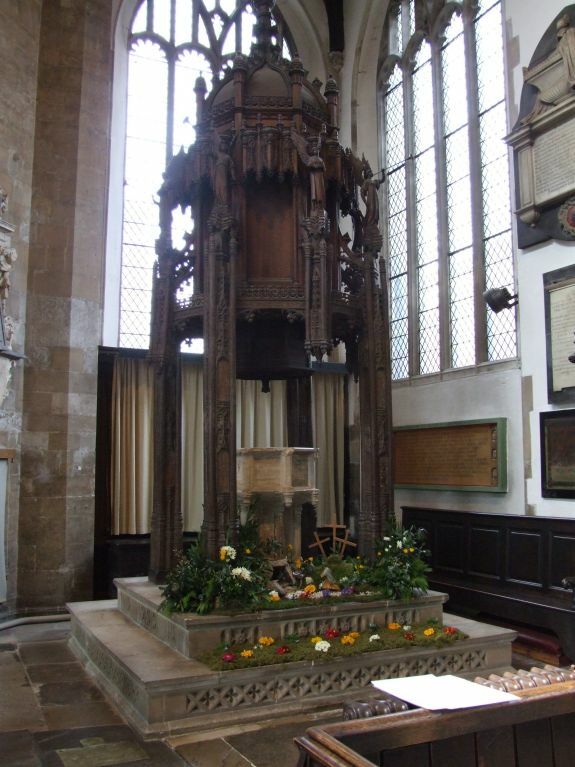 Above the font is the famous font canopy. 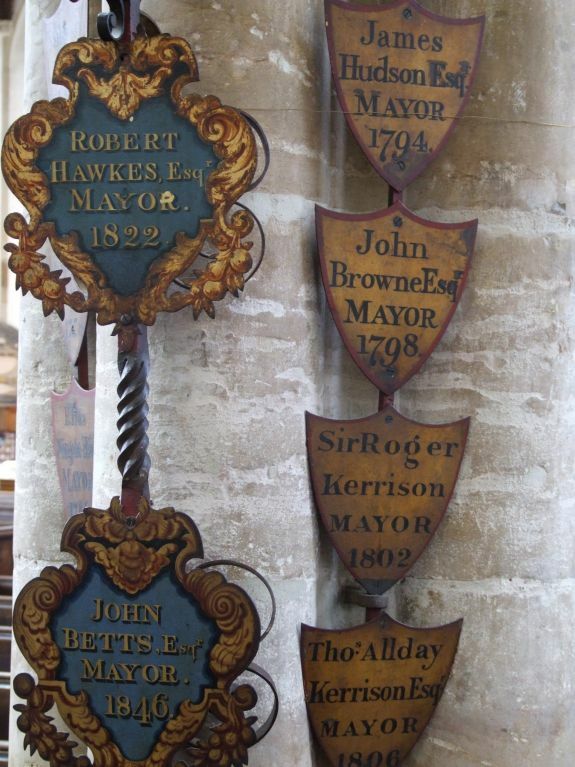 Now, font canopies are so rare - there are only four of them, and they are all so different - that it is not particularly useful to compare them. Certainly, that here reflects the rather grander example at Trunch, some twenty miles away. 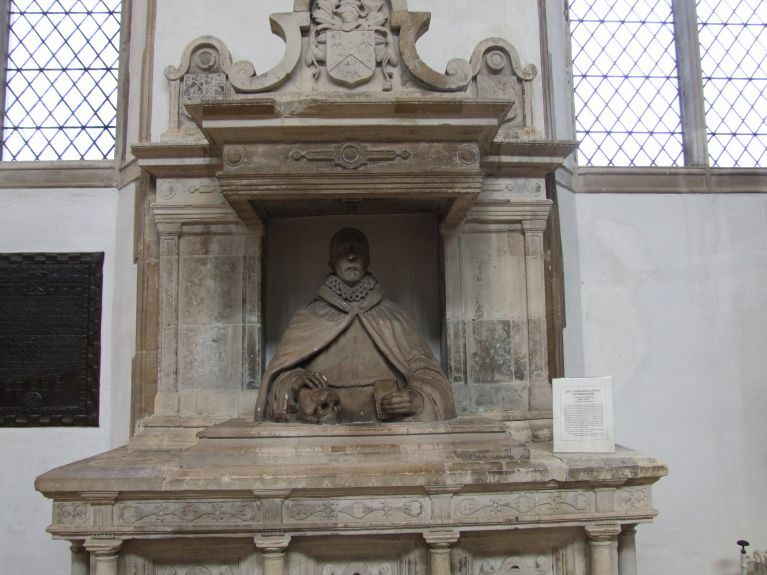 Since the other two are either post-Reformation (Durham) or made of stone (Luton), it might make sense to think of the Norfolk two as a unique pair. Here at St Peter Mancroft, much of the upper part is a 19th century restoration, and there seems to have been some attempt to copy Trunch. The lower part is more interesting, with its niches and canopies. It must have been spectacular when the font was intact. 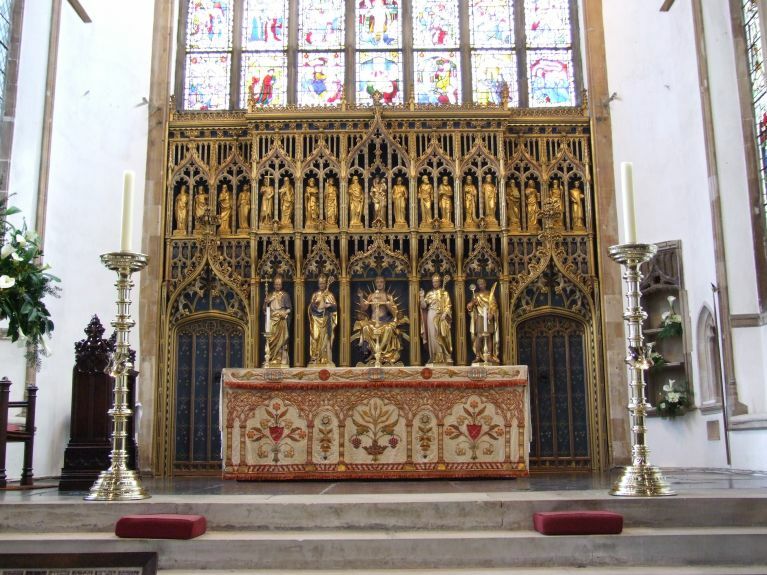 Pevsner tells us that the gilded reredos in the sanctuary is by JP Seddon, but that Ninian Comper restored and enlarged it in the early 1930s. It is not exciting, but that is probably as well, for above it is one of the greatest medieval treasures of East Anglia. This is the medieval glass that survives from the first few decades of the existence of the church. Some of it was probably in place that first Petertide. 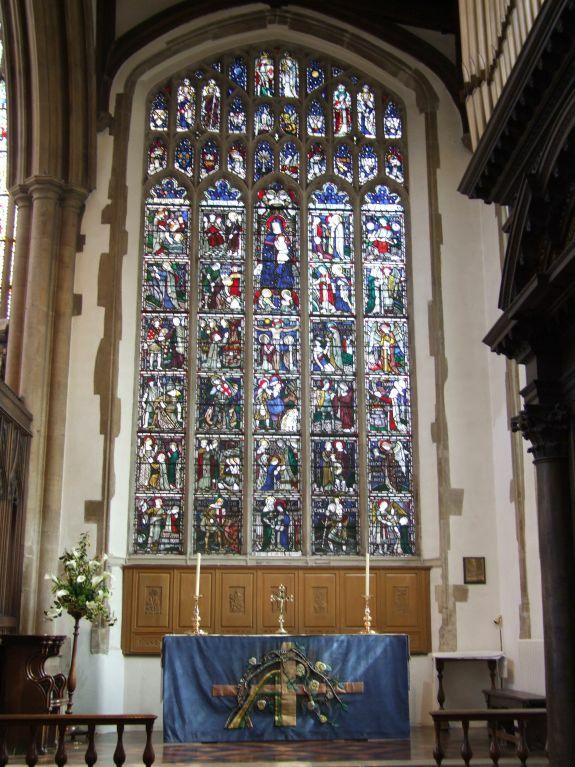 It has been moved around a bit since then; the whole east side was blown out by an explosion in 1648, and the glass has been removed on several occasions since, most recently during the Second World War. After East Harling, it is the finest expanse of Norwich School glass of the 15th century. I had for some time felt the need for a new camera, and when circumstances fell sympathetically (sufficient Co-op divi, and an impending birthday) I became a proud owner of a Fuji S9600. I bought it from Amazon, and the morning it arrived I cycled off to the station and headed up to Norwich to try it out. The first place I came was St Peter Mancroft, and the first thing I photographed was the glass of the east window. After a few false starts, I photographed every panel. I had no tripod, and the light was not perfect, so be merciful, but here is the great east window of St Peter Mancroft presented in virtual form. Hover over an image to find out what it is, click on it to go to a page on the flickr website that gives you it in enlarged form. By selecting 'all sizes' on that page, you can also see it very big indeed. 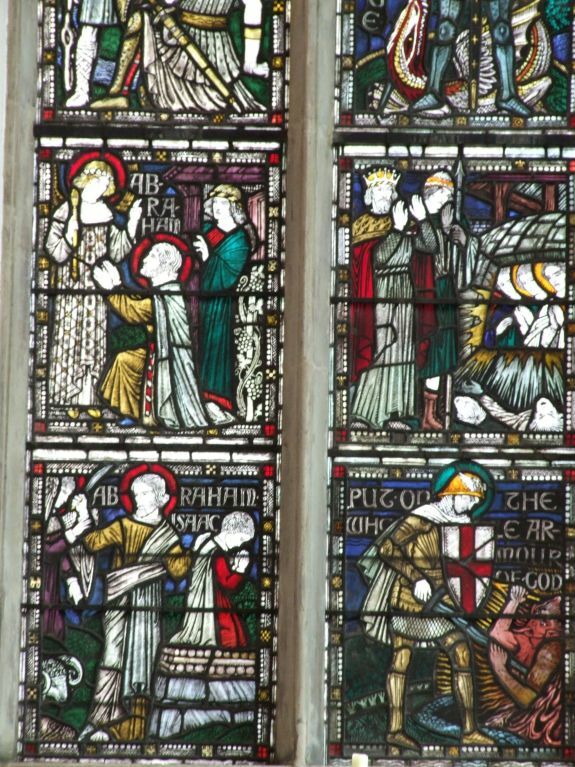 Books have been written about the glass at St Peter Mancroft, and there is neither time nor space to go into too much detail here. Suffice to say that this is the work of several Norwich workshops, probably working in the Conesford area of the city along what is today King Street. 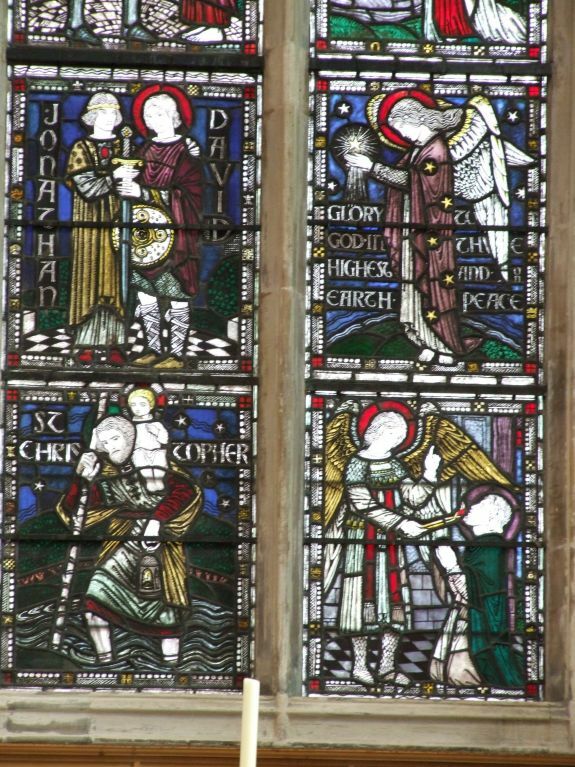 It is obvious that some other glass in East Anglia is from the same workshops using the same or similar cartoons, notably North Tuddenham in Norfolk and Combs in Suffolk, and of course most obviously, East Harling. Indeed, by comparison with East Harling in the 1920s, the historian Christopher Woodforde was able to deduce some of what was missing here, and what there. There are several sequences, most notably the Story of Christ from the Annunciation to the day of Pentecost. This extends into a Marian sequence depicting the story of the Assumption. There are also scenes from the stories of St Peter and St John, and other individual Saints panels, including St Faith, a significant cult in late medieval Norwich. The panel of St Francis suggests that it was also once part of a sequence. The lower range depicts the donors, some of whom are identified. The central spine is largely modern glass by Clayton and Bell for the Streets in the 1880s. Some of the missing glass is now at Felbrigg Hall. In any other church, the 1921 glass by Herbert Hendrie in the south chapel aisle chapel would be considered outstanding. It is in the style of Eric Gill, but feels rather heavy handed next to the extraordinary delicacy of its medieval neighbours. While I was here, I stopped taking photographs for the one o'clock prayers. One of the custodians stood at the lectern and read very eloquently from the Acts of the Apostles, and said prayers for the city and its people. Apart from me, there were only two other listeners in the vast space. It was tenderly and thoughtfully done, but I couldn't help thinking that it is the exterior of this wonderful structure which is the Church's true act of witness in central Norwich now.